The decision made by the Government in 2007 with regard to the establishment of a Free Economic Zone in Tetovo, relived the hopes for mitigation of unemployment in this part of the country. However, the question is what really happened with the tendering process and who actually sits behind the tender-winning company as a concessioner of the above-mentioned zone? Placed before a record number of unemployed, i.e. more than 30% at a national level, Macedonia has not yet found ways to attract foreign capital. The technological and industrial development zones, which offer to investors numerous tax alleviations, are part of the strategy for rapid development whose aim is the economic recovery of the country. 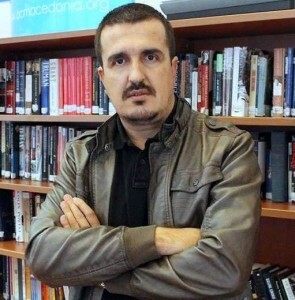 The decision made by the Government in 2007 with regard to the establishment of a Free Economic Zone in Tetovo, relived the hopes for mitigation of unemployment in this part of the country. Following the successfulness of the first free economic zone in 2000 near Skopje, the one planned for Tetovo was the fourth on the list. Spread on 95 hectares of land, this zone has a very attractive position, since it is situated in the crossroads of Corridors 8 and 10. The governing political parties propagated a real investment heaven in this region, announcing some seven thousand new jobs from its initial phase. However, the question is what really happened with the tendering process and who actually sits behind the tender-winning company as a concessioner of the above-mentioned zone? 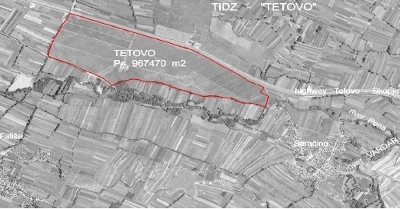 Unlike the development zones in Skopje and Stip managed by the Government itself, it was decided that the Tetovo development zone was to follow the public-private principle. This meant offering the zone in question to a private company that will have ownership rights for the next 99 years. According to official data, the announced tender in 2012, i.e. the offer for a Free Economic Zone in Tetovo was handed in by two companies qualified from the very first phase. The concerned companies were the Turkish consortium “TBS Yonetim Isletmeve Insast Anonim Sirketi” represented by the domestic company “Pera Constraction Internacional doo Skopje”, as well as the Norwegian company “Small Business Association of Norway (SNS)”. The company representing the Turkish company, with its headquarters in Skopje, according to the documentation provided by the Central Registry Office, is owned by the Turkish businessperson HalilIrfanBumen, though other businesspersons such as Ajdovan Ademovski and Dame Bozinoski have fewer shares in it. Meanwhile, the Norwegian company is in fact a businesspersons’ association, which would later be presented with its original name “Smaabedrifforbundet”. Government officials later began to refer to SNS as “a strong Norwegian consortium”. This consortium, based on provided information, consists of the corporation for Norwegian Industrial Development SIVA (whose founder is the off-shore company SIV Holding LTD, placed in Victoria Island), the “Innovation Norway” company, “Normac Investment Group”, the small-business development company “Smaabedrifforbundet”, the company for transport of goods and investments “Tonnevold”, as well as the known American company “Blackard Group”. The frictions between lobby groups within the parties in power is said to have caused the failure of this tender and re-open it in October last year. Among the application terms and conditions was that they were supposed to have a total of ten million Euros of annual incomes in one of the last years for which there is proven evidence, as well as considerable experience in managing these kinds of zones or industrial parks. Unlike the previous call, there was only one company that applied this time – Normac Investment Group (NIG), which was earlier said to be part of the Norwegian consortium SNS. However, this time the NIGCompany itself appeared as a consortium consisting of five Norwegian companies, three of which were private and two public. “This is a consortium which has great experience in managing free economic zones and this actually means 100 accomplished projects in this field. Thus, we will finally have some economic development for the Polog region and inflow of free capital, meaning more jobs for the community”, ValonSaracini, Minister of Economy said on 15 January while talking about the NIG Company, which won the tender for managing with the development zone in Tetovo. Apart from the Minister Saracini, the Director of the Directorate for Development Zones, Viktor Mizo, as stated on the official website of the Ministry of Economy, referred to the tender winner as a consortium. “The Normak Investment Group consortium consists of four Norwegian trade associations and an American one, dealing with real estates in the industrial sector,” Mizois cited to have said. 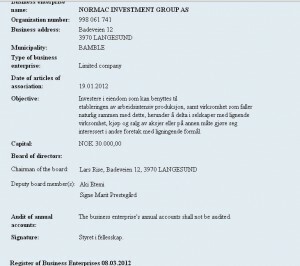 However, SCOOP managed to gain access to the documentation from the Registry of Norwegian Companies where it can be seen that NIG is not a consortium consisting of three public and two private Norwegian companies. In fact, NIG is a very small company registered in March 2012 with an overall capital of only 30,000 Norwegian Krone (about 4,000 (four thousand) Euros). The Norwegian citizens Lars Rise and Signe MaridPrestegardas well as the Macedonian citizen Aki Etemi appear to be the founders of this company. 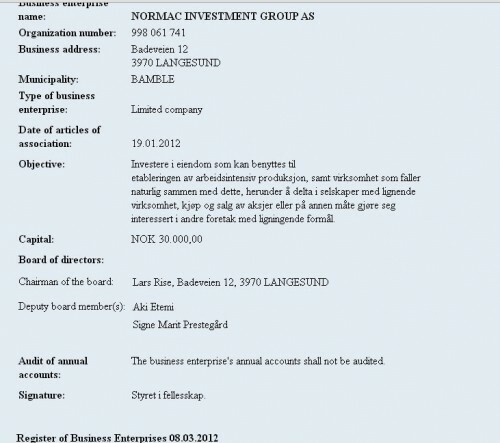 The names of other five Norwegian companies cannot be found on the official documents related to the tender winner for the administration and management of the free economic zone in Tetovo, which were allegedly part of the so-called consortium. Soon after they got the tender, on February 1st of this year (2013), NIG established a new company in Macedonia known as “Normak Investment Group AD Tetovo”, with an initial capital of 50,000 (fifty thousand) Euros. 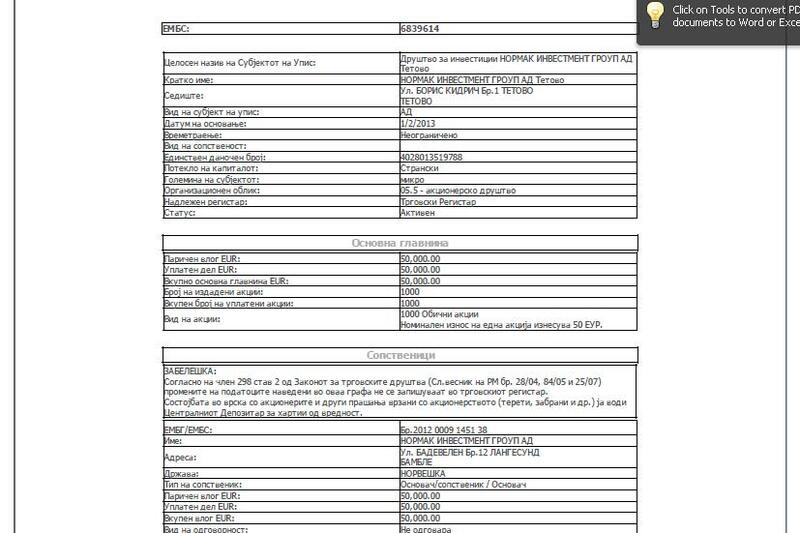 The document obtained from the Central Registry of Macedonia does not cite any of the Norwegian or the American companies as mentioned by the government officials. In fact, this company does not have a clue about managing free economic zones nor it fulfils the precondition of owning 10 million Euros of total annual incomes; it was registered a couple of months before the tender for the Tetovo free economic zone was announced. This increases the suspicions that the establishment of this zone has been made in order to alienate around 95 hectares of industrial land near Tetovo. It is said that the members of the board of directors of this company in Macedonia are people closely affiliated to the Democratic Union for Integration (DUI), which is part of the governing coalition. The name of one of the members of the board of directors appears on the documentation of the State Auditing Office where the financial donors of the DUI for the needs of the last premature parliamentary elections have also been listed. The 58-year-old Lars Rise, appearing as the director of NIG seems to have had a rich political biography. 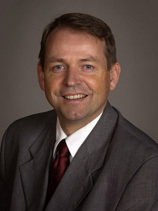 In the period from 1997 to 2005, he was an MP of the Demo Christian Party in the Norwegian Parliament; earlier he had also held some important government positions. While people in Normac Investment Groupare rubbing their hands due to the obtained tender, the youth population of Tetovo and Gostivarare still hoping for an investment boom in this region. The public-private partnership, applied for the first time in this zone, will probably prove to be a failure. Several months after the conclusion of tendering procedures, neither the state nor the private partners have begun the activities in order to functionalize this development zone. The unemployed, on the other hand, always say that it is too early to lose hopes.